Who do you think this mummy is? Posted: Sun Jul 25, 2004 6:42 pm Post subject: Who is this Woman? 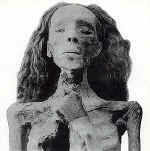 In the cache of KV 35, the tomb of Amenhotep II, the mummy of this royal lady was found. 1. She must have been a Queen, because she is mummified with her left arm bent. 2. A lock of her hair was found in Tutankhamenâ€™s tomb in a miniature coffin naming Queen Tiye. 3. There is a close similarity between this mummyâ€™s skull and that of Thuya, the known mother of Tiye. I've always thought this to be Tiye. After reading your 'NEWS' postings this noon, I looked up 'hair' on Google. Wound up with a picture of the mummy as well and was actually thinking this is the one which strikes me the most. She just "breathes" royalty and noble stature. In death she seems as noble as in life. "Bigger than life" popped to mind. Call it shallow, but I think she resembles the known statues of Tiye as well. I know it's a dubious thing to compare Egyptian imagery to actual human remains, but considering the birth of a realist tendency during the reign of Amenhotep III (early early Amarna art so u will) that is not even such a stretch. Then again, the blood tests cause a major problem. U'd expect there to have been a dna-test comparing Tut's lock of hair and those of the mummy's though. Any proof of that? I know it doesn't have to actually be Tiye's hair - even if found in a box with her name inscripted (after all, it wouldn't be the first artifact usurpation in Ancient Egyptian history) - but it would be a strong backing up of the theory this mummy being Tiye. I love that statue. It is royalty personified. I always thought that the hair was a good argument towards the identification of the mummy as Tiye as well. The bloodgroup discrepancy is strange however. Besides, I have a feeling that there may have been quite a family resemblance between several of the royal women. I can't really find an age for this mummy. I seem to remember reading somewhere that the woman died in her mid-forties, which is rather young for Tiye, unless you allow for a rather long co-regency. Posted: Mon Jul 26, 2004 7:50 am Post subject: Re: Who is this Woman? Cost $60 But I found from Barnes & Noble. Some authors take the hair analysis as conclusive evidence that this is Tiye. But just vecause the cofinette has the name Tiye on it, doesn't mean that without a doubt that the hair is Tiye's. The question also rises: what was the meaning of the lock of hair? Was it a momento of a beloved mother or grand-mother? Did it have ritual significance? Was it some ancestral object? The problem with the blood group is worrysome though. I don't know if it makes it unlikely that this lady is the daughter of Tuya, or if it makes it impossible. The skulls show enough similarity to indicate a family relationship. Would that indicate that the woman is maybe a grand-daughter of Tiye instead of her daughter? Or even a cousin. If we look at female relatives of Tuya who played an important role in the life of Tutankhamen, and died in their forties the list doesn't seem very long. If Nefertiti is the grand-daughter of Aye, as so may books state without any definitive proof, then it might point more in the direction of Nefertiti than Tiye. If the woman was slightly younger than we think it could even be Ankhesenamen or Sitamen. It's just strange that even when you think you have quite a bit of information, there is just not quite enough to make a 100% proof identification. She would've been too young, like you said. A daughter of Nef and Akh can quite easily be excluded as well. Still she is most likely a queen. Nef or Tiye? Do you think Nefertete's mummy would be granted enough respect to be taken care of like this, securing her remains in a new tomb? I doubt it. Another option: u quoted Nef as a Tiye relative? Then what if we continue down this line and disregard the negative views on Nef and Mutnodjmet (Horemhebs wife) as being Akhmim-relatives? Then Mutnodjmet stands a big big chance of being the noble woman as well, no? Now there's an option you didn't yet think of! Sooo prrrroud of myself. I vote Queen Tiye. How could it be Neffertiti with this mummy having her hair? Neffertiti has her head shaved to wear her tight-fitting high crown didn't she? Plus, like our buddy Segereh said, how wouldshe have escaped the vandalism unless somebody buried a handmaiden or something in her place and made it look like her? Anyway, Queen Tiye is who I think it is. Take care! Considering the argument about Nefertiti's reburial. If you buy the "they would have vandalized her body" theory, then they would not have stopped at damaging the mummy. They would have totally destroyed it. If you want to damage someone in memoriam you destroy their bodies completely. Which means that according to you logically Nefertiti would never be found. Which may or may not be true. I don't know. But the partial damage people claim as evidence for it being her makes absolutely no sense to me whatsoever. They reburied the body in KV 55 (either Smenkhare or even Akhenaten himself????) , so why wouldn't they grant Nefertiti's mummy this much respect? If they would villify the wife, don't you think they might go after the mother as well? I just don't see that argument making any sense whatsoever in making an argument for Tiye but against Nefertiti. I do not think it's likely to be Nefertiti by the way. But not for any of the reasons you gave. I just think the woman was to old when she died to be her. My reason for asking the question was really to brainstorm who it could be if not Tiye. And the blood work casts some doubt on that identification. It should be said though that we don't have any idea when Sitamen died, so we can't say if the lady is of the right age or not. Reading that again, I realized that I may have come off a bit more sarcastic than was my intention. I voted for Queen Tiye as well. Is there any other examples of having a lock of hair as a keepsake? Also of having that buried with them? It would seem to have some importance. Why put it in a minature coffin with someone else's name on it? Granted I would love for the mummy to be that of Sitamun, I guess she would be my "second guess" as it were. When exactly was the blood grouping done? What I'm thinking is, if it was done when this kind of testing was still relatively new, just exactly how accurate is it? I don't mean to say that it's wrong exactly, just as a possibility. Also was this mummy included in the DNA testing that was done? A seperate question, but while it's in my mind.... the mDNA (I believe it is) the one that is past down by the mother only. Ok lets say they take a sample from Thuya, then a sample from the mummy in question. Would the mDNA be identical? I hope I'm not being confusing here. Basically I'm saying is that for example, Thuya, Tiye, and Sitamun would they all have identical mDNA? This is really just for my own understanding. Ok, now that I've completely confused myself I'll stop. "Queen Mutnodjemet was buried in Horemheb's tomb. Bones were found to be identified as hers. The body was that of a woman in her mid-forties, who had lost her teeth and had had several children. She was buried with the body of a baby. She may have died in child-birth. Mutnodjemet was apparently buried in year 13 of her husband's reign. This is inferred from writing on amphora in the burial chamber." Weird I didn't think about it. Should I start doubting that mummy to be Mutnodjmet's? Exactly my point there: the mummy wouldn't have survived. But I think I'm seeing other reasons for it than you do. There's still the question if Nef died or simply fell out of grace... If it was the latter, just like what seems to have happened to Kiya, there's not much in the way of a pre-Restauration "curse on Nefer". This would then not be an act from the Restauration-period, which makes perfect sense, looking at the possibility of the survival of Akh's (or Smench's) mummy. Biggest point you can make against that theory is why Nef didn't disappear from the public eye (no iconoclasm - to once again use the word). Even disregarding that, I was never pointing at the damage this mummy had suffered, just as I didn't ever say to believe this mummy to be Nef's. You know way too well how controversial the body and coffin of KV55 are. I personally consider them to be Smench's - stuff for another thread though - but even if: Nefertiti's vilification doesn't need to have been a thing from the Restauration-period. As I said in the previous bit. This would make sense, seeing the body of "cursed" pharaohs still intact. You can not forget here, how in the starting days of Tut 'nothing happened'. It took up to three years to moove the capitol to Memphis and really abandon the Amarna-heritage. If both kings were to be desecrated, it would've taken more than 10 years to do so. If Nef really was put aside during Akh's reign, it would never have taken that long. That doesn't make much sense. Did Hatshepsut's parents get "cursed"? Did Akhenaten's father get "cursed"? Did even Tutankhamen get "cursed" for whom his parents may have been? (He did get erased by later sources, but seems to have just been 'in the middle of things'.) There are different rules for common people and royalty. Even if the latter knows some 'bad apples' not the entire dynasty is blamed for it. Amenhotep III was Akhenaten's father. Did he get slandered even once? Where do you come up with a vilification against Tiye? Regardless who her daughter (and son!) would have been, she was A III's wife. Even when still very close to Akhenaten when he had mooved to Amarna, she doesn't seem to have suffered any form of iconoclasm whatsoever, not during or after the Amarna-age. Some people appear to be above that. Whatever her connection to Nef and Akh may have been, she was still considered to be A III's wife in the first place. Or so it does very much seem to be. Same questions as (member) Sitamun's there. But you're right, brainstorming here as well. You can always find some decently sounding arguments, but they always seem to have a 'contra' or a good base for reasonable doubt. Same goes for Nefertiti actually. Did she die when disappearing from the public eye? Still not saying this is her. Good question. I don't know when the blood work would have been done. I have wondered about mistakes as well. I don't know if this mummy was included in the DNA testing. I think you're referring to the word done by Scott Woodward? I have only seen one reference to any results he may have had. Yes the mitochondrial DNA was passed down from the mother to her children. So in this case Tuya and all her children would have had the same mDNA. Her daughter Tiye would have passed it on to all of her children. So that would include Akhenaten, Sitamen and all her other children. The problem with mDNA is that it only tells you that a person belongs to a certain female line. Suppose that Tut shared the same mDNA, then this could mean that he was the son of Tiye, but he could also be the son of Sitamun, or of any lady related via the mother's side to Tuya and Tiye. So for family relations it seems to work to rule people out, but not to confirm any direct family relationships. Considering the year of burial, that better be Mutnodjemet I think. I have never heard of anyone doing "cranio-morphological comparisons" with the other mummies. If she's Aye's daughter, she should resemble Tuya and Tiye. Or if she takes after the (grand)father, maybe resemble Yuya? That's something I've never understood about those skull comparisons. What if the offspring just looked like the other parent? I wasn't referring to something you said. I think you're raising the possibility that Nefertiti "got in trouble" during the reign of Akh already? And therefore may have either not been mummified or had her remains destroyed? What type of transgression would lead Egyptians to not mummify someone? Seems extremely harsh punishment.